Objective: The aim of this study was to assess the pomegranate juice against the growth and toxin production of multidrug-resistant Clostridium difficile hypervirulent strain NAP1/027/BI and also against the growth of beneficial bacteria to prevent or suppress C. difficile infection (CDI). Materials and methods: Minimum inhibitory concentration (MIC) and minimum bactericidal concentration (MBC) were taken as parameters for the assessment of antimicrobial property of the pomegranate juice. Four different C. difficile hypervirulent strains NAP1/027/BI, Lactococcus lactis spp., Lactobacillus casei, and Bifidobacterium animalis were subjected to the broth dilution method to determine the MIC and MBC. Enzyme-linked immunosorbent assay (ELISA) was performed to determine clostridial toxin B (TcdB) production in the presence of pomegranate juice. Results: The MIC and MBC of pomegranate juice containing punicalagin were found to be 390 µg/mL for all C. difficile hypervirulent strain NAP1/027/BI, and the growth of L. lactis spp., L. casei, and B. animalis was not inhibited. Pomegranate juice reduced TcdB production in C. difficile hypervirulent strain NAP1/027/BI. Conclusion: This study highlights the potential of pomegranate juice to reduce CDI without affecting the beneficial bacteria. Pomegranate juice may be a useful antimicrobial agent to prevent or suppress CDI, avoiding the use of antibiotics. Clostridium difficile is an important nosocomial pathogen. C. difficile infection (CDI) causes severe gastrointestinal disease in individuals undergoing treatment with antibiotics.1 C. difficile produces two major toxins, namely, clostridial toxin A (TcdA) and clostridial toxin B (TcdB), which is responsible for toxin-mediated inflammation and disease. These toxins are mainly responsible for stimulation of an inflammatory response and cause damage to the mucosal epithelium in the gut.1 Toxin B (TcdB) from ribotype 027/NAP1/BI is associated with an increased cytotoxicity, which leads to enhanced virulence.2 C. difficile hypervirulent ribotype 027/NAP1/BI strain is associated with an increased morbidity and mortality.3 Vancomycin, fidaxomicin, and metronidazole are antibiotics currently used for the treatment of CDI. However, C. difficile strains resistant to metronidazole and reduced susceptibility to vancomycin have been reported in few studies.4,5 It is more difficult to treat C. difficile hypervirulent ribotype 027/NAP1/BI strain with fidaxomicin and vancomycin than other strains.6 The development of multidrug-resistant bacteria is due to the prolonged use of antibiotics.6 This has significantly limited the efficacy of antibiotics. The increased virulence, degree of resistance, and recurrence of CDI have prompted the development of new antibacterial agents for the treatment of CDI. A group of lactic acid bacteria (LAB) are called beneficial bacteria including probiotic strains of the Lactobacillus, Bifidobacterium, and Enterococcus genera.9 These organisms are called probiotic organisms due to their beneficial roles in the gut, particularly essential in maintaining the intestinal microbial balance for inhibiting the growth of pathogenic microorganisms.10 The growth of beneficial bacteria, such as Lactobacillus, Lactococcus, and Bifidobacterium, may therefore modulate gut microbiota. The healthy gut microbiota provides protection against numerous pathogens including C. difficile.11 Susceptibility pattern of Lactobacillus, Lactococcus, and Bifidobacterium to pomegranate juice is of interest in understanding the alteration of normal intestinal microflora when pomegranate juice is taken. We hypothesized that pomegranate juice may reduce toxin production and also provide antibacterial effect against multidrug-resistant C. difficile hypervirulent strain NAP1/027/BI, without inhibiting the growth of some beneficial bacteria, which is advantageous in preventing CDI and recurrence. For this purpose, we studied the toxin production of C. difficile hypervirulent strain NAP1/027/BI in the presence of pomegranate juice and also studied the antibacterial effect of pomegranate juice against multidrug-resistant C. difficile hypervirulent strain NAP1/027/BI, Lactococcus lactis spp., Lactobacillus casei, and Bifidobacterium animalis. Four different C. difficile hypervirulent strains NAP1/027/BI, L. lactis spp., L. casei, and B. animalis were obtained from Routine Diagnostic, Institute for Medical Microbiology, University Hospital Leipzig (Leipzig, Germany). All bacteria included in this study were again confirmed by matrix assisted laser desorption/ionization (VITEK MS; bioMérieux, France) according to manufacturer’s instruction. All four C. difficile hypervirulent NAP1/027/BI strains were again confirmed by GeneXpert C. difficile PCR assay (Cepheid, Sunnyvale, CA, USA) according to the manufacturer’s instructions. Pomegranate juice was brought from POM Wonderful (Los Angeles, CA, USA), which contains the following concentration of polyphenols: 1561 mg/L of punicalagins, 387 mg/L of anthocyanins, 121 mg/L of EAs, and 417 mg/L of other hydrolyzable tannins. According to European Committee on Antimicrobial Susceptibility, the MICs of pomegranate juice against different bacteria were determined in 96-well microtiter plate with round bottom. Different concentrations of pomegranate juice containing punicalagin ranging from 24.37 to 780 µg/mL were prepared in brain heart infusion broth for C. difficile, de Man Rogosa Sharpe broth for L. casei and B. animalis, and Mueller-Hinton broth for L. lactis spp. by serial dilutions. Then, 100 µL of standardized working bacterial suspension was inoculated into each column containing different concentrations of 100 µL of pomegranate juice and also to growth control (100 µL of medium), which provided the required final inoculum density of ~105 CFU/mL. Afterward, the plates were incubated at 37°C for 48 hours at anaerobic condition for C. difficile, L. casei, and B. animalis and at 37°C for 24 hours in a CO2 incubator for L. lactis spp. Inhibition of bacterial growth was determined visually. All the strains were tested in triplicate. MBC was determined by sub-culturing 10 µL of samples from each MIC well onto a fresh solid medium (brucella agar supplemented with 5% laked sheep blood and vitamin K1 [1 mg/L] for B. animalis and C. difficile, de Man Rogosa Sharpe agar for L. casei, and Tryticase soy agar with 5% sheep blood for L. lactis spp. ), and the plates were incubated at appropriate temperature and condition for specific time. The highest dilution that yielded no single colony of bacteria was considered as MBC. To determine the time period required for antimicrobial activity of pomegranate juice against C. difficile, the concentration of pomegranate juice containing punicalagin equal to the MIC value and growth control was incubated with the bacteria final inoculum density of ~105 CFU/mL. The samples were harvested after 1, 2, 3, 6, 9, 12, and 24 hours. The harvested samples (10 µL) were streaked in brucella agar plate and were incubated at 37°C for 48 hours at anaerobic condition. To measure TcdB released into the culture medium, the samples were harvested at 48 hours from MIC plate. An enzyme-linked immunosorbent assay (ELISA) for C. difficile toxin A or B (tgcBIOMICS, Bingen am Rhein, Germany) was used according to the manufacturer’s instructions to measure TcdB levels. Two-way ANOVA was performed with Dunnett’s test using PRISM seven to calculate the antibacterial effect and also TcdB expression with multiple comparisons. P-value <0.001 are considered statistically significant. MBC was determined by sub-culturing 10 µL of samples from each MIC well onto a fresh solid medium (described in the “Materials and methods” section). A number of bacterial colonies were counted. Lowest concentration of pomegranate juice containing punicalagin that killed 100% of bacteria was considered as MBC. The MIC and MBC of pomegranate juice containing punicalagin were found to be 390 µg/mL for all C. difficile hypervirulent strain NAP1/027/BI (results are shown in Figure 1 and Table 1). Growth of L. lactis spp., L. casei, and B. animalis was not inhibited by pomegranate juice containing punicalagin (results are shown in Table 1). Results were obtained in triplicate. Figure 1 Determination of MBC for C. difficile against pomegranate juice. Notes: Determination of MBC for four different C. difficile NAP1/027/BI strains. The final concentrations of pomegranate juice containing punicalagin ranging from 24.37 to 780 µg/mL were incubated with bacteria. GC and SC were also included. The number of bacteria colonies grown against pomegranate juice were counted. 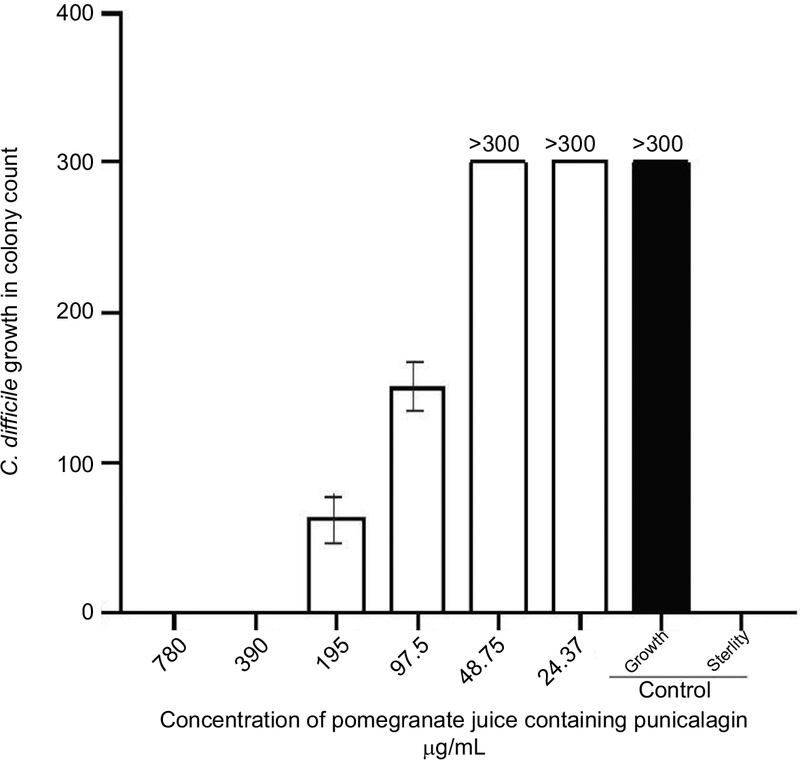 MBC of pomegranate juice containing punicalagin was found to be 390 µg/mL for all four C. difficile strains. 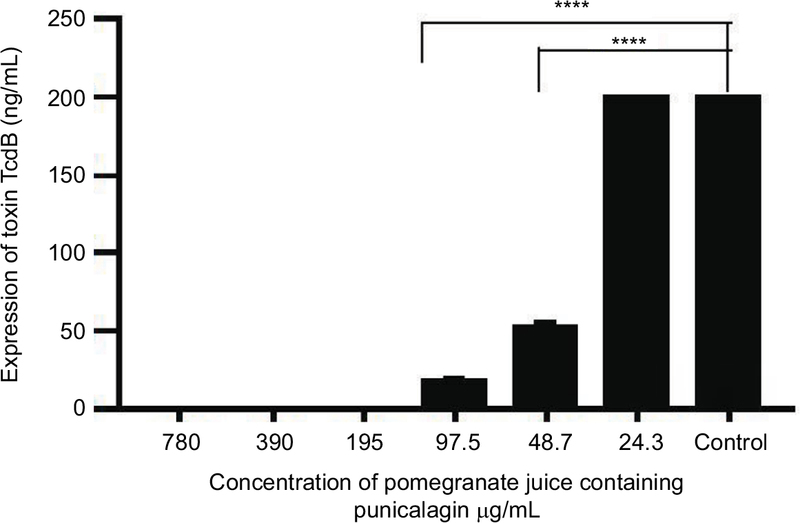 Pomegranate juice containing punicalagin inhibited C. difficile growth in dose dependent manner. Abbreviations: C. difficile, Clostridium difficile; GC, growth control; MBC, minimum bactericidal concentration; SC, sterility control. Notes: Determination of MIC and MBC for four different Clostridium difficile NAP1/027/BI strains, Lactococcus lactis spp., Lactobacillus casei, and Bifidobacterium animalis. The final concentration of pomegranate juice containing punicalagin ranges from 24.37 to 780 µg/mL. GC and SC also included. Culture media having pomegranate juice containing punicalagin at different concentrations and control media were prepared. (+) means growth, (−) means no growth. MIC was identical to MBC. Abbreviations: GC, growth control; MBC, minimum bactericidal concentration; MIC, minimum inhibitory concentration; SC, sterility control. To determine the time period for antimicrobial activity of the pomegranate juice, an experiment was performed as described in the “Materials and methods” section. C. difficile growth found in 1 hour, 2 hour and in growth control plate while all the remaining plates showed no growth. Thus, the time period required for antimicrobial activity of pomegranate juice against C. difficile was found to be 3 hours (data not shown). To determine the TcdB production of C. difficile in the presence of pomegranate juice, an experiment was performed as described in the “Materials and methods” section. Pomegranate juice containing the concentration of punicalagin ranging from 48.7 to 780 µg/mL decreased the expression of TcdB. Results were obtained in duplicate (results are shown in Figure 2). Figure 2 Expression of TcdB in the presence of pomegranate juice. Notes: Expression of TcdB from Clostridium difficile hypervirulent strain in the presence of different concentrations of pomegranate juice containing punicalagin ranging from 24.3 to 780 µg/mL and in the control. ****Indicates toxin expression was greater than 200 ng/mL. Abbreviation: TcdB, clostridial toxin B. In this study, pomegranate juice inhibited the growth of C. difficile hypervirulent strain NAP1/027/BI but did not inhibit the growth of some probiotics species such as L. lactis spp., L. casei, and B. animalis. A number of other studies have investigated the effects of pomegranate polyphenols on the growth of individual bacterial species. In a recent study, POMx, a pomegranate extract (husks, seeds, and peel remaining after juice production), and pomegranate juice stimulated the growth of bifidobacteria and lactobacilli and inhibited the growth of B. fragilis group, Clostridia, and Enterobacteriaceae in stool cultures.12 In another study, POMx stimulated the growth of total bacteria, Bifidobacterium spp., and Lactobacillus spp. and inhibited only the growth of Clostridium coccoides, Eubacterium rectale group, and the C. histolyticum group.13 The growth of pathogenic Pseudomonas aeruginosa, Escherichia coli, Staphylococcus aureus, and Clostridia was significantly inhibited by punicalagins.14,15 POMx may be a useful therapy for the prevention of CDI.16 POMx may inhibit the colonization of pathogen in the colon by inducing the growth of probiotic bacteria in the colon.17,18 The probiotic bacteria species such as lactobacilli and bifidobacteria inhibited the growth of pathogenic C. difficile.19,20 Thus, probiotics may be useful to prevent the colonization of pathogenic species in the lumen and subsequent adhesion and invasion in to the gastrointestinal mucosa. Dietary polyphenols and their metabolites are useful to maintain the gut microbial balance by stimulating the growth of beneficial bacteria and inhibiting the growth of pathogenic bacteria.31 Our result suggests that a commercial common pomegranate juice may be useful for maintaining the intestinal microbial balance by stimulating the beneficial bacteria growth, which prevents the colonization of potential pathogens such as C. difficile in the gut and also reduce CDI directly by its antimicrobial activity. The drugs of choice for treating CDIs have been antibiotics. However, a few studies have reported strains resistant to metronidazole or with reduced susceptibility to vancomycin.4,5 Fidaxomicin has a single target (RNA polymerase), and resistance to fidaxomicin has also already arisen during clinical use.6 Lysis of cell wall has been documented in bacteria exposed to phenolic compounds.23,24 Disruption of bacterial cell membrane leads to the loss of membrane potential, impaired ATP production, and leakage of intracellular contents.25,26 To the best of our knowledge, no reports on antimicrobial resistance to pomegranate polyphenol have been documented, which may be due to its multiple mechanisms of action potentially preventing the formation of resistant strains. Ideal therapies for CDI would selective target only the specific pathogens and protect the beneficial bacteria in the gut, which is advantageous in the restoration of colonization resistance. Metronidazole and vancomycin currently remain the mainstay antibiotics for the treatment of CDI, but these antibiotics cause significant disruption to the normal gut microbiota.27 Antibiotics treatment repeated for the recurrent CDI promotes dysbiosis, which further disturbs colonization resistance. In addition, repeated use of metronidazole and vancomycin promotes the development of vancomycin-resistant enterococci.28 Recurrence of CDI after treatment with metronidazole and vancomycin was found to be 27.1 and 24.0%, respectively.29 Recurrent CDI mainly results from a disruption of beneficial bacteria in the gut by antibiotic therapy. Pomegranate juice may be useful in maintaining the intestinal microbial balance, and it may be useful to prevent the recurrence of CDI. Pomegranate as well showed a significant anti-inflammatory activity in the gut30 apart from its antibacterial activity against C. difficile and prebiotic activity. Overall, the use of antibiotics to kill toxigenic C. difficile has several disadvantages such as resistance development, disruption of normal gut microbiota, recurrence of infection, and enhanced pathogenesis due to increased toxin production. To the best of our knowledge, no reports on microbial resistance to pomegranate polyphenol have been documented and this study showed that pomegranate juice inhibited the C. difficile without disturbing the normal microbiota and decreased the toxin production as well. Pomegranate juice is a novel antimicrobial agent that could potentially fulfill the requirements for improved CDI treatment and ability to spare the normal gut microbiota. Our results suggest pomegranate juice, a common commercial fruit juice, may be a useful antimicrobial agent to prevent or suppress CDI, avoiding the use of antibiotics. Further investigation in a clinical study will be required to determine the potential of pomegranate juice to prevent or suppress CDI. All authors contributed to data analysis, drafting and revising the article, gave final approval of the version to be published, and agree to be accountable for all aspects of the work. Voth DE, Ballard JD. Clostridium difficile toxins: mechanism of action and role in disease. Clin Microbiol Rev. 2005;18(2):247–263. Lanis JM, Heinlen LD, James JA, Ballard JD. Clostridium difficile 027/BI/NAP1 encodes a hypertoxic and antigenically variable form of TcdB. PLoS Pathog. 2013;9(8):e1003523. Barbut F, Mastrantonio P, Delmée M, et al; European Study Group on Clostridium difficile (ESGCD). Prospective study of Clostridium difficile infections in Europe with phenotypic and genotypic characterisation of the isolates. Clin Microbiol Infect. 2007;13(11):1048–1057. Brazier JS, Fawley W, Freeman J, Wilcox MH. Reduced susceptibility of Clostridium difficile to metronidazole. J Antimicrob Chemother. 2001;48(5):741–742. Peláez T, Alcalá L, Alonso R, et al. In vitro activity of ramoplanin against Clostridium difficile, including strains with reduced susceptibility to vancomycin or with resistance to metronidazole. Antimicrob Agents Chemother. 2005;49(3):1157–1159. Goldstein EJ, Citron DM, Sears P, Babakhani F, Sambol SP, Gerding DN. Comparative susceptibilities to fidaxomicin (OPT-80) of isolates collected at baseline, recurrence, and failure from patients in two phase III trials of fidaxomicin against Clostridium difficile infection. Antimicrob Agents Chemother. 2011;55(11):5194–5199. Cowan MM. Plant products as antimicrobial agents. Clin Microbiol Rev. 1999;12(4):564–582. Gil MI, Tomás-Barberán FA, Hess-Pierce B, Holcroft DM, Kader AA. Antioxidant activity of pomegranate juice and its relationship with phenolic composition and processing. J Agric Food Chem. 2000;48(10):4581–4589. Teuber M, Meile L, Schwarz F. Acquired antibiotic resistance in lactic acid bacteria from food. Antonie Van Leeuwenhoek. 1999;76(1–4):115–137. Fuller R. Probiotics in man and animals. J Appl Bacteriol. 1989;66(5):365–378. Wilson KH. The microecology of C. difficile. Clin Infect Dis. 1993;16(suppl 4):S214–S218. Li Z, Summanen PH, Komoriya T, et al. Pomegranate ellagitannins stimulate growth of gut bacteria in vitro: implications for prebiotic and metabolic effects. Anaerobe. 2015;34:164–168. Bialonska D, Ramnani P, Kasimsetty SG, Muntha KR, Gibson GR, Ferreira D. The influence of pomegranate by-product and punicalagins on selected groups of human intestinal microbiota. Int J Food Microbiol. 2010;140(2–3):175–182. Bialonska D, Kasimsetty SG, Schrader KK, Ferreira D. The effect of pomegranate (Punica granatum L.) byproducts and ellagitannins on the growth of human gut bacteria. J Agric Food Chem. 2009;57(18):8344–8349. Reddy MK, Gupta SK, Jacob MR, Khan SI, Ferreira D. Antioxidant, antimalarial and antimicrobial activities of tannin-rich fractions, ellagitannins and phenolic acids from Punica granatum L. Planta Med. 2007;73(5):461–467. Finegold SM, Summanen PH, Corbett K, Downes J, Henning SM, Li Z. Pomegranate extract exhibits in vitro activity against Clostridium difficile. Nutrition. 2014;30(10):1210–1212. Gibson GR. Prebiotics as gut microflora management tools. J Clin Gastroenterol. 2008;42(suppl 2):S75–S79. Onoue M, Kado S, Sakaitani Y, Uchida K, Morotomi M. Specific species of intestinal bacteria influence the induction of aberrant crypt foci by 1,2-dimethylhydrazine in rats. Cancer Lett. 1997;113(1–2):179–186. Naaber P, Mikelsaar M. Interactions between Lactobacilli and antibiotic-associated diarrhea. Adv Appl Microbiol. 2004;54:231–260. Trejo FM, Minnaard J, Perez PF, de Antoni GL. Inhibition of Clostridium difficile growth and adhesion to enterocytes by Bifidobacterium supernatants. Anaerobe. 2006;12(4):186–193. Bouillaut L, Mcbride S, Sorg JA, et al. Effects of surotomycin on Clostridium difficile viability and toxin production in vitro. Antimicrob Agents Chemother. 2015;59(7):4199–4205. Aldape MJ, Heeney DD. Amy Evelyn Bryant and Dennis Leroy Stevens Tigecycline suppresses toxin A and B production and sporulation in Clostridium difficile. J Antimicrob Chemother. 2015;70:153–159. Negi PS. Plant extracts for the control of bacterial growth: efficacy, stability and safety issues for food application. Int J Food Microbiol. 2012;156(1):7–17. Borneman WS, Akin DE, Vaneseltine WP. Effect of phenolic monomers on ruminal bacteria. Appl Environ Microbiol. 1986;52(6):1331–1339. Tsuchiya H, Iinuma M. Reduction of membrane fluidity by antibacterial sophoraflavanone G isolated from Sophora exigua. Phytomedicine. 2000;7(2):161–165. Plaper A, Golob M, Hafner I, Oblak M, Solmajer T, Jerala R. Characterization of quercetin binding site on DNA gyrase. Biochem Biophys Res Commun. 2003;306(2):530–536. Rea MC, Dobson A, O’Sullivan O, et al. Effect of broad- and narrow-spectrum antimicrobials on Clostridium difficile and microbial diversity in a model of the distal colon. Proc Natl Acad Sci U S A. 2011;108(suppl 1):4639–4644. Al-Nassir WN, Sethi AK, Li Y, Pultz MJ, Riggs MM, Donskey CJ. Both oral metronidazole and oral vancomycin promote persistent overgrowth of vancomycin-resistant enterococci during treatment of Clostridium difficile-associated disease. Antimicrob Agents Chemother. 2008;52(7):2403–2406. Vardakas KZ, Polyzos KA, Patouni K, Rafailidis PI, Samonis G, Falagas ME. Treatment failure and recurrence of Clostridium difficile infection following treatment with vancomycin or metronidazole: a systematic review of the evidence. Int J Antimicrob Agents. 2012;40(1):1–8. Colombo E, Sangiovanni E, dell’agli M. A review on the anti-inflammatory activity of pomegranate in the gastrointestinal tract. Evid Based Complement Alternat Med. 2013;2013:1–11. Cardona F, Andrés-Lacueva C, Tulipani S, Tinahones FJ, Queipo-Ortuño MI. Benefits of polyphenols on gut microbiota and implications in human health. J Nutr Biochem. 2013;24(8):1415–1422.